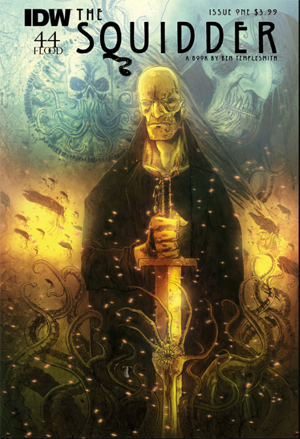 The Squidder, the subject a rather successful Kickstarter from acclaimed writer and artist Ben Templesmith (as featured here), is set to appear from IDW beginning in July, thanks to an agreement between the publisher and 44FLOOD. Backers of the Kickstarter campaign will be getting the story in graphic novel format (or the swanky slipcased “Kraken” edition) but for those that didn’t contribute to the campaign the story will be issued as a limited series. Templesmith has stated that the Kickstarter edition will be different, the “Director’s Cut” featuring additional scenes not available in the individual issues. For those not in the know The Squidder is about an old soldier from a forgotten war in a post-apocalyptic world that has left him behind. It features horror, fantasy, and Lovecraftian elements, as well as black humour.